When a new iPhone or two come out every year, there are a few things that have to happen before we can call it a success. First off, there has to be lines outside Apple Stores as people get ready to pick up their new iPhones. Then, we have to have some sort of faux controversy, like antennagate, or bendgate. 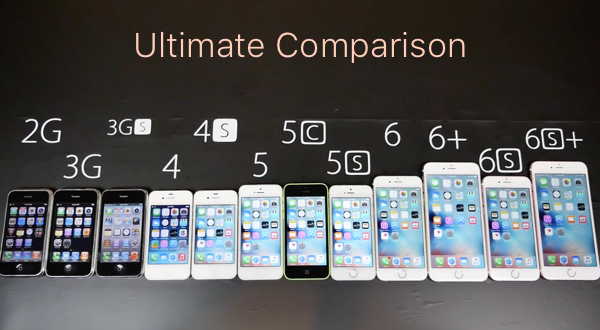 Then someone has to put together a video showing the new iPhone compared to every other iPhone in existence, as if to prove that yes, years of improvements have made each new iPhone faster than than the last. This year, the year of the iPhone 6s and iPhone 6s Plus, we obviously had the lines although we have yet to have our faux controversy, though it’s still very early days. In preparation of that though we have already had the iPhone comparison we just spoke of, with YouTube channel EverythingApplePro taking to, well, YouTube to show off each and every generation of iPhone in one video. The tests range from boot up times to WiFi speed tests, with some synthetic benchmarking thrown in for good measure. There is even some good old HTML5 speed testing going on here, something that Steve Jobs would no doubt approve of given his love affair with it back when apps weren’t a thing. Oh those were the days. If you don’t want to sit through the entire six minute video then we can save you the effort because, somewhat predictably, the new generation of iPhones smoke everything that came before it. If you really want to see how mobile technology has advanced over the last eight years though, pay particular attention to what an iPhone 6s can do when thrown up against the original, first generation iPhone. Remember when that thing seemed so futuristic? If you ever wondered where all the innovation had gone from the world of desktop CPU power, then wonder no more. It’s alive and well in the palm of your hand.